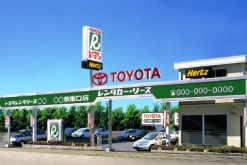 Hertz has a marketing partnership with Toyota Rent a Car in Japan for years. Now, you're able to reserve a rental car from Toyota Rent a Car in 60 major cities in Japan through Hertz network. Simply reserve your car before your departure, then you can pick it up at location to get on the road right after that. You will be enjoying the trip in Japan. - Approx. 200 locations in 60 cities are bookable. - Online reservation can be made via www.hertz.com, GDS, or Hertz reservation center. - Advance reservation is required at least 72 hours prior to pickup. - One-way rental is allowed with designated drop off charge.